On 27th June 2016, the Cairngorms National Park Authority launched a consultation on the next five-year National Park Partnership Plan. The consultation focuses on 9 big issues to do with conservation, visitor experience and rural development. The second of the nine ‘big issues’ is “Deer and Moorland Management – delivering the public interest in upland land use”. In this blog I hope to encourage you to make your views known and to explain why moorland management is a big issue for the National Park. The Cairngorms National Park is an extremely important place for nature conservation. Even before it came into being in 2003, 50 per cent of the landmass was already designated for its landscape or ecological value. It is home to approximately 18,000 people and the rural economy remains fragile. It is also extremely important we get the ‘balance’ right between nature conservation and rural development. Without doubt one of the many things that keep me and my colleagues in the CNPA busy is the fact that everybody has a different perspective on where the centre of that balance should be! Collectively we have to find a way through all the debates and ensure our plans for the future deliver all four Aims of the National Park. That’s where the National Park Partnership Plan comes in, and everyone who cares about the future of the National Park has the opportunity to put across their points of view. Moorland management is a significant land use in the National Park, extending to nearly 2000 km2 (approximately 40 per cent of land cover) shaping much of the landscape. This is a huge area within which there is ample room to find areas where we can increase habitat diversity, link with and strengthen other habitats. Six estates in the East of the National Park have joined forces to create the ‘East Cairngorms Moorland Partnership’, which seeks to combine the delivery of public and private interests and the successful integration of grouse moor management with other land use objectives. It is a positive initiative which I’m sure will prove worthwhile and will, I hope, provide useful pointers to moorland managers in other areas. Whilst some are going headlong into maximising grouse others are finding ways to maximise all diversity on moorland and create landscapes that not only support healthy grouse populations but many more species of flora and fauna. Some fantastic examples of peatland restoration have recently taken place on moorland in the National Park. More widely, increased control of deer and sheep grazing on some moors has resulted in a fascinating re-emergence of willow species and juniper. These ‘scrub’ species provide perfect habitat for black grouse and perfect cover for red grouse (known as the ‘willow grouse’ in the rest of Europe). If willow, juniper, birch, aspen etc are allowed to expand on the edges of existing woodland and open moorland, they can provide a wonderful upland ‘ecotone’, a third habitat, that is almost entirely missing in the UK. This summer I have had the pleasure of helping out on a survey mapping juniper, dwarf birch and montane willows like Salix lapponum (downy willow) and Salix repens (creeping willow). The willows are incredibly rare, but there are some tiny fragments left in Scotland, with some of the best remnants in the National Park. 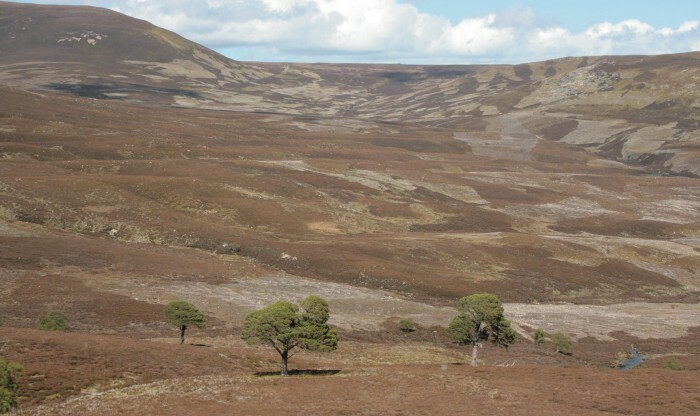 The Cairngorms Nature Action Plan prioritises the restoration of montane scrub. With the willows come many more plant and animal species that will all lead to an increasingly diverse and more productive upland landscape. There is more than one basket for grouse eggs! Back in the 1980s and 90s the forest industry gained a bad reputation for creating monoculture with a high impact on landscape and other habitats leading to public criticism that is difficult, even today, to shake off. Forestry has changed in the intervening years with a much greater emphasis on e.g. ‘low impact silvicultural systems’ and ‘continuous cover forestry’ to maximise biodiversity alongside productivity. We need to learn from this! Moorland management faces similar challenges now and also needs to adapt to modern needs and demands. The current reviews of the ‘Principles of Moorland Management’ and the ‘Muirburn Code’ provide a perfect opportunity for doing just that. Advancements in our understanding of climate change, carbon sequestration and the importance of our peatlands will also be vital in guiding future moorland management. In the last few years we have seen a number of estates in the National Park increase their management emphasis on driven grouse shooting. Red grouse have been doing quite well perhaps partly because of climate, but it is very likely that changes in management have boosted productivity. A quick snapshot of some of these changes… medicated grit (containing the powerful antiparasitic drug, flubendazole) is much more regimentally and extensively used to control threadworms in grouse. Ticks that debilitate and carry a range of diseases are much more extensively “mopped up” by sheep periodically dosed with cypermethrin (or other such chemicals). Sheep are contained on the moor within new stock fences and deer are excluded with new deer fences. Mountain Hare are culled to reduce the likelihood of transfer of ticks to grouse. Hill tracks repaired, upgraded or new tracks created to allow easier access to the moors. In places keepers have trialled cutting as an alternative to muirburn. New technology is assisting predator control and new methods of diversionary feeding for raptors have been trialled. As with all forms of land use, there is good practice and bad practice. In the National park we should always aim at promoting the good and stamping out the bad. It is legitimate to question and defend or otherwise, the combination of positive or negative effects from all of these activities. For example what are the impacts of chemicals like cypermethrin (toxic to all insects and fish) and flubendazole on the food chain or on our water courses and the species living within them? Is serious resistance to these drugs just around the corner and will it lead to population crashes? Is it right that we have to think twice about drinking straight from a burn on a grouse-moor? At a time when the dominant factor shaping future land use policy is climate change, is it right that we continue such extensive muirburn; exacerbating erosion, emitting carbon into the atmosphere and water-courses and preventing the regeneration of trees which could be ‘locking up’ carbon? Can moorland managers do more to help flood management by allowing more shrub/tree growth and blocking moor-grips to ‘slow the flow’? How long can we go on saying we are all “disappointed” to hear of another case of raptor persecution in the National Park? With 43 per cent of employment in the National Park depending on tourism, careful management of the landscape, habitats and species must be paramount in our minds. The National Park offers the perfect location to try out new initiatives like the East Cairngorms Moorland Partnership. With other partners in the Moorland Forum we can trial new approaches to adaptive moorland management. Only through dialogue and developing mutual understanding can organisations, individuals, public and private interests grow to appreciate one-another’s passions and motivations and find the common ground. It is time to move with the times. We need to see practical action and clear demonstration that moorland managers are universally responding to modern needs and demands. The National Park Partnership Plan consultation ends on 30th September 2016, responding to any of the Big Issues highlighted in the plan will be time well spent. Please visit our website for the full consultation and make your views known.